As smartphone gaming has become so popular, the runner genre has seemingly reached the popularity levels of the 2D platformer and first-person shooter before it. 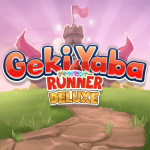 The latest title of the genre to grace the 3DS eShop is Geki Yaba Runner Deluxe. It's apparently titled Deluxe due to its presence as a mobile game on Android and iOS; on those platforms, the game is free but contains ads and a limited number of lives. 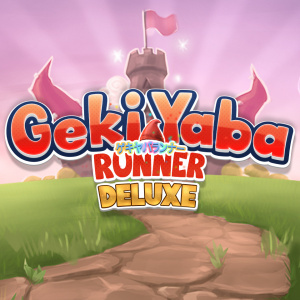 To further complicate matters, Geki Yaba Runner is extremely similar to the WiiWare and 3DS eShop title 2 Fast 4 Gnomz, meaning that Geki Yaba Runner Deluxe is far from a new title. However, let's see if it's worth your download money! The story is essentially non-existent here; you control a gnome whom the king tasks with saving the princess. For some reason, collecting socks is essential to this quest — as your gnome runs along the stages, you'll have to collect a certain number of them to pass. 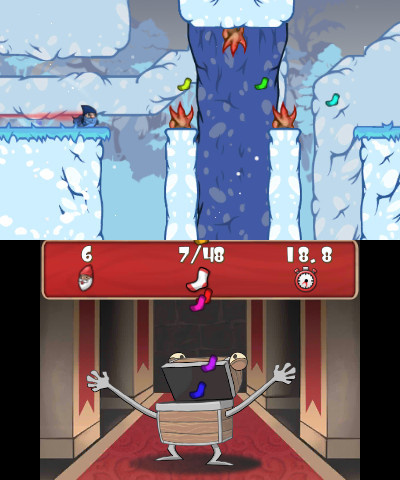 Aside from grabbing socks you'll find a more difficult optional goal in each stage. Sometimes this requires you to nab a hard-to-reach golden sock, or collect every single sock on the stage. There's no reward for taking on these harder challenges, so they only serve as extra replayability for completionists. Your gnome has a few tricks up his sleeve. You can hold the A button to deploy a parachute, which lets you glide and even catch gusts of wind to gain altitude. After a certain point, you can hold down on the D-pad to break through obstacles and fall faster, but this limits your jump. The game does a pretty good job of introducing new tactics in a safe environment, then forcing you to prove your skills with them. Before long you'll be letting go of your glide with perfect timing in order to drop down and break a log in your way. It gets pretty intense, but not always in a good way. Many levels involve trial and error, as there's no way to see what's coming until you've played a section a few times and memorized it. The levels only last a minute or two, and frequent checkpoints keep the frustration down, but there are certainly sequences that take several tries just to calibrate your jumps. It's evident that this game has roots as a mobile title — the aesthetics are fine, but nothing spectacular. Infrequent short cutscenes between some levels look solid, and the graphics are cartoony but attractive enough; 3D is present, which isn't fantastic but comes as a nice touch. The background music is quite repetitive and the sock-collecting sound gets old fast, so after a few levels you'll probably prefer to play this on mute. One interesting mechanic of Geki Yaba is its level skip feature. At any time you can choose to skip a level without beating it. However, you can't skip another level unless you go back and complete the level you previously skipped. Since you'd have no way to otherwise progress, this allows you to keep playing even when a level is too tough. With just a few controls, the input is decent but not quite where it needs to be. Jumping and holding A to open your parachute in a tight space is a problem, as the glider fails to deploy and you splat into the wall. Thankfully you restart almost instantly after a death, but you may have some hurdles with the controls at times. 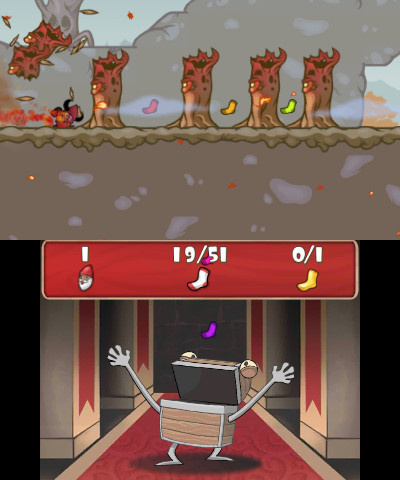 As is a problem with most runners, there are also several objects that seem to blend into the background, making it hard to distinguish threat from decoration. There aren't any massive problems with Geki Yaba Runner; but it is rather bland. The levels tend to get rather 'samey' and boring in an extended play session, and the graphics and sound aren't anything impressive. With over 100 stages, there's plenty of content here for the asking price, but none of it sticks out. The difficulty also ramps up to a pretty high level in later stages, leading to inevitable frustration for less-skilled players. 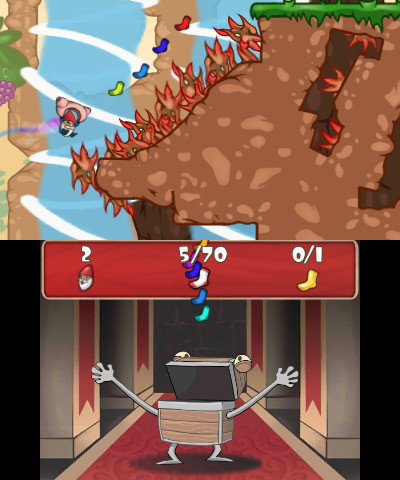 Geki Yaba Runner Deluxe is an inoffensive, typical mobile runner repackaged for 3DS. It doesn't excel in any particular area, but it's far from bad. The controls are passable, and fast restarts mean that you can jump right back in when you hit an obstacle you never saw coming. If you're into this genre there's a good challenge present with replayability in the optional objectives; it's most tolerable in short play sessions. There are far better and more unique runner games on the eShop, but this will get you by if you need something to pass the time. You can always give the game a try on your phone to see if you like it; just note that you'll have to pay for extra lives on mobile. The paid package price on 3DS is half that of the 'unlock' on mobile at present, too, so it's certainly worth consideration. @Zach777 because of it's presence also on phone store which is same but most likely slightly altered a bit and for those that don't realize and have it on phone think its a dif game. @edgedino Hey, thanks! I was going to ask this too. 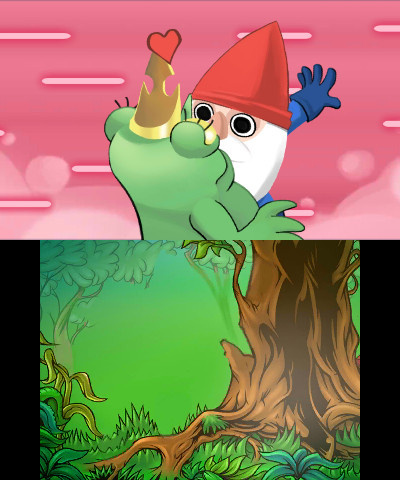 Anyway, I thought Gnomz was legit fun but the runner less so, so I'll probably skip this one.